Bioglitter® strikes gold for a 2nd time at In Cosmetics Global. Bioglitter stikes gold again!!! 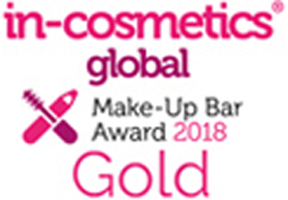 For the second year running Ronald Britton are awarded Gold for Cosmetic Bioglitter® Pure for most Innovative Cosmetic Raw Material at In Cosmetics 2018 in Amsterdam. Cosmetic Bioglitter® Pure is Ronald Brittons latest range in the Bioglitter® Product Family and is the first of its kind a glitter that is 100% plastic free, 100% aluminium free, 100% antimony free and biodegradable in the natural environment. Cosmetic Bioglitter® Pure will become both available to sample and also available commercially in September 2018. Great to see Bio-Glitter® used by BodyFX at the #HoldTight festival in New Zealand which was supported by ANZ. Keep up to date with all our new products and latest news! Please fill in your details to sign up for our newsletter - it's great to have you! Bioglitter® has been developed and is manufactured by Ronald Britton Ltd. Ronald Britton Ltd is a British company and have been involved with the supply of glitter products to the UK market for over 40 years.